Have you ever had one of those days where you couldn’t remember what you just read? Or, you find yourself working longer, but your productivity is declining. There are many reasons why we’re not effective. Currently, I’ve been bombarded by distracting construction noise. It’s not easy to control your work environment, but one helpful service I found is called Focus@Will. The service combines specific instrumental tracks with an online timer. The company says its technology can increase focus and attention spans by up to 400%. If you’re like me, you probably scrunched your eyebrows when you saw that 400% number. What does that mean? Despite my skepticism, I decided to give the service a try for a couple months and learn more about how it works. There are two ways to try the service without making a commitment. You can sign up for a free 15 day trial (no credit card needed). I started with the 15-day trial. While you could build a playlist from the YouTube samples, you wouldn’t get the full suite of music channels or tools. At first, I didn’t think this was important until I realized how much more music was on the site including beta tracks. I also learned that while one channel might work for me one day, I might prefer a different channel the next. There were a few exceptions such as the ADHD channel, which didn’t work for me anytime I tried it. One area that appealed to me is the optional timer. Ideally, I liked to complete a session of 40+ minutes and then take a short break. When you hit your time mark the system provides a slight chime and the music stops. I find using the timer makes me want to complete the session without succumbing to the typical interruptions like email, phone calls and #Slack. I would be more interested in seeing something like a Pomodoro Technique where I could count sessions or have an overall time goal. You also have the option of using the Productivity Tracker and rating your productivity on a simple scale if your session was over 20 minutes. This rating may appeal to some people, but I didn’t think it provided much value for me other than the timer. 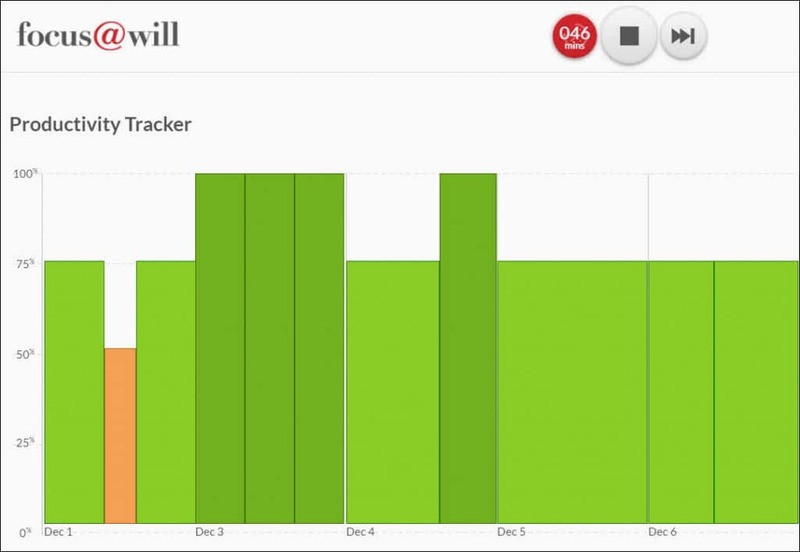 For those people who do want to track session productivity, you can see additional information. Each session is shown as a bar and the width indicates the time duration. In the screen snap below, you can see 3 sessions on Dec 3rd. And on Dec 5th, I had a longer session where I didn’t set the timer. While this info may be useful for some, I didn’t find there was anything actionable or insights I could glean. Looking back, why did I provide a 50% rating on that second session on Dec 1st? Perhaps, it was a specific music channel that didn’t appeal to me as much. This is the area where I think the service gets it right. It offers enough variety and depth to appeal to most people. There are some common denominators among the channels. For example, there are no lyrics by design. You can read more on the site, but supposedly the brain splits its attention when it encounters lyrics or “voice-like” sounds. That’s also why you won’t hear instruments that have a voice like quality such as cellos, saxophones, and others. This selection criterion also rules out Jazz. As you can see from the snap below, there are over 20 channels if you include the LABS. If you were to ask me to define the music, I would have a hard time for a couple of reasons. The first is I know very little about music. Even when I do like something, I can’t tell you why. It’s just something I feel. I’m more apt to tell you what I don’t like such as the ADHD channel, which seemed jarring to me. Most of the channels weren’t memorable, but I think that’s by design. You don’t want something that is going to steal your attention, but something that just dulls out the other sounds. 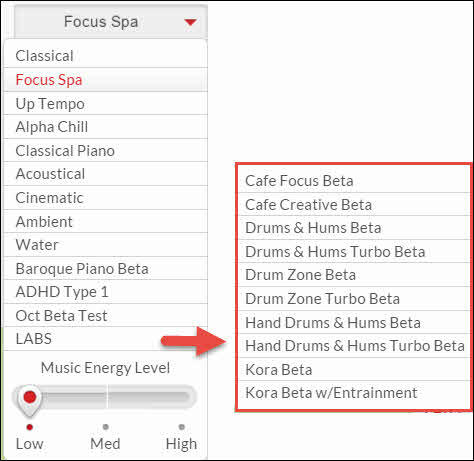 Focus@Will is a nice service that provides numerous neuro-music instrumental tracks that can improve your focus. I'm not certain about the claim of improving attention spans. I do think the services can make you more disciplined so that you stay on track. Given that the company offers a 15-Day free trial, I think people should check it out. Cost: $9.95 monthly. The company also offers gift subscriptions.